The first thing I didn't know about Bermuda was that it was only an hour and a half from New York via plane. The second was that the multi-island nation currently has the fourth highest GDP per capita in the world, thanks to its attractive tax schemes. A former British colony, the island served as a weekend getaway for my first visit in July of 2017. 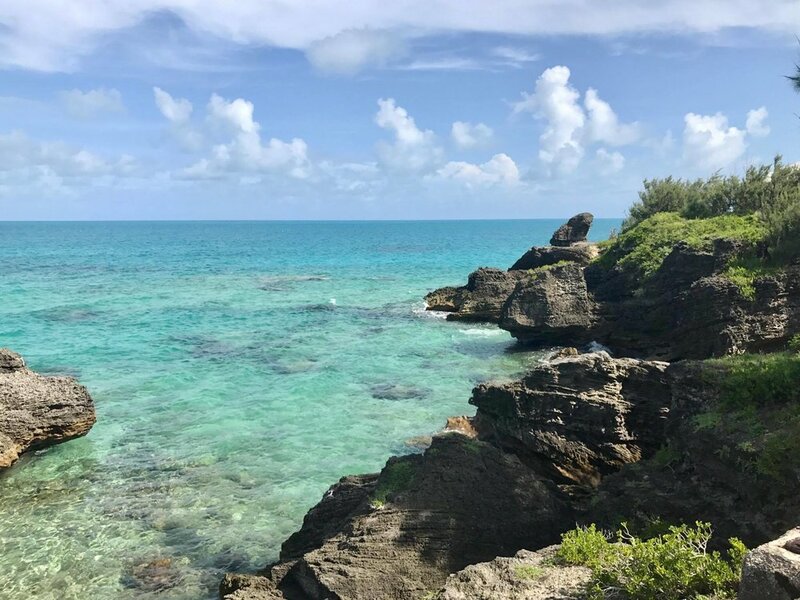 Over two days, I discovered the endless pristine beaches of Bermuda, explored crystal caverns, and dived off cliffs into turquoise lagoons and aquamarine waves. (Read: hesitantly staggered off the ledges due to my fear of heights). As we lived in Hamilton Parish on the island, the trip began with an early morning walk to Crystal Caves near the airport. One of the only times I walked on the island, this particular trail by the cliffs in the north-east side of the main island covers some abandoned railway tracks. Note: transportation is primarily car and bus based in Bermuda. Sidewalks may continue for a while on the winding roads but suddenly stop and end. It's best to get bus tokens on your first day here, otherwise taxis can usually only be found at hotels and in town, and can easily run upwards of $30-50 dollars for a 20-30 minute trip. The cliffs that roll into the crystal blue waters are of particular shape and formation. A delight to behold and photograph at every angle. Truly a rare locale where #nofilter applies to every photo. A wonderful trail for a morning walk, with ample places to stop and take in the view. Always a priority, we stopped at an island favorite, the original Swizzle Inn for an early lunch. 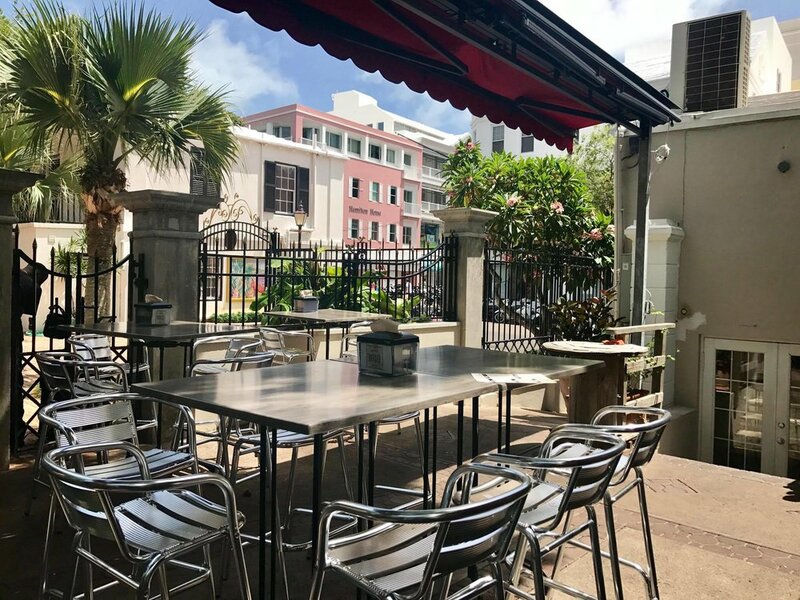 The famous saying in Bermuda at this oldest pub goes "Swizzle Inn, Swagger Out," and its famous bar is credited with the invention of the Swizzle, the national cocktail. The Swizzle, seen on the left here, is a blended concoction of rum and fruit juice. Another cocktail Bermuda is credited with inventing is known as dark 'n' stormy, again a rum based drink with ginger beer. Never having had a preference for sweet cocktails, the latter was my drink of choice for this trip. 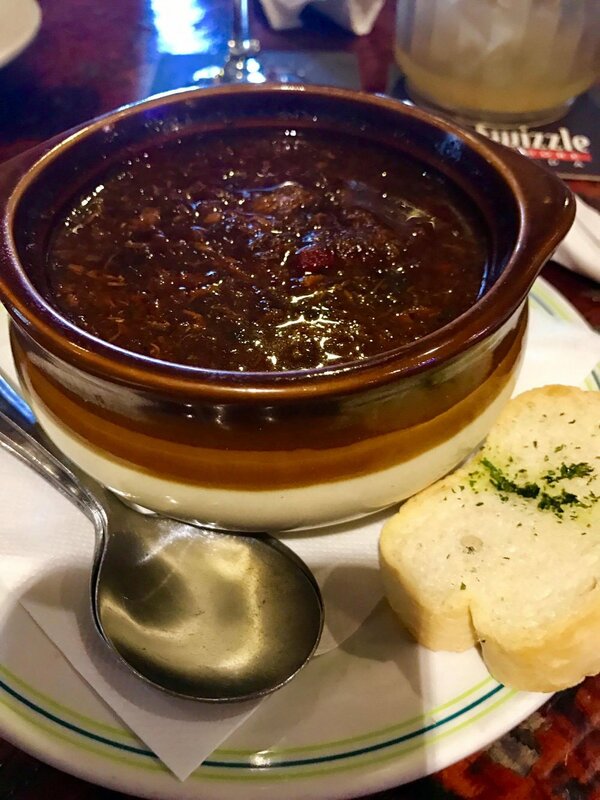 One cannot sample culinary delights on the island without starting with Bermuda's famous fish chowder. A soup somewhat on the heavy and salty side, chunks of fish are abundant in the concoction, and one is encouraged to pour vinegar and rum into the soup for additional flavor. Conch fritters - a favorite snack of mine consumed on this trip. Dipped in a little tartar sauce, definitely a fun bite and an interesting way to eat conch. Say conch five times fast. Rockfish on the left, a staple fish for natives, served in the grilled version along with caramelized bananas and onions, plus a baked potato. Surf 'n' turf, right. Finally, for a sweet touch at the end of the meal, head across the street to Bailey's Ice-Cream for a home-made sweet treat. In-line with my, *ahem*, tastes, I ordered the two alcoholic items on the menu. Top scoop: rum raisin, bottom - dark 'n' stormy. A little on the sweet side but nonetheless two delightful scoops of ice-cream, worth a visit if you're eating at the original Swizzle Inn or visiting the crystal caves. 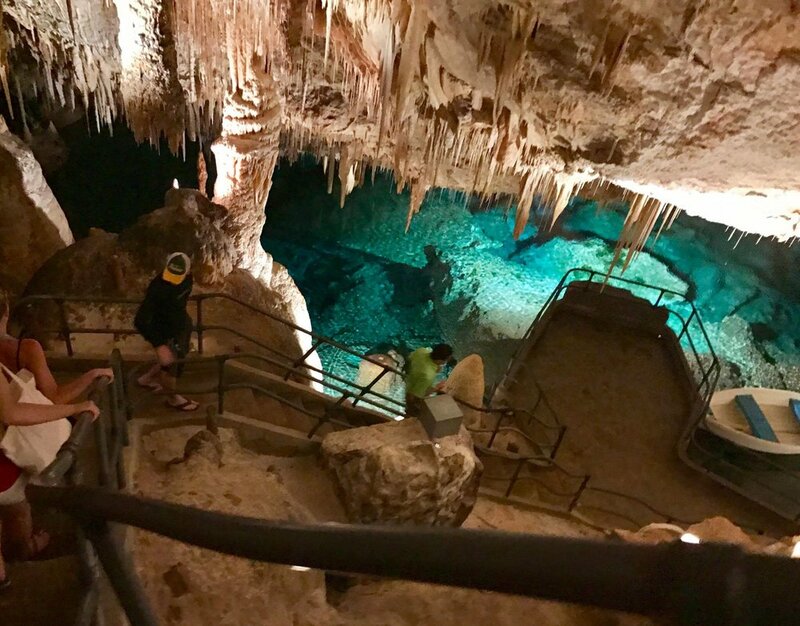 Crystal Caves on the north-eastern side of the island is definitely a highlight and a good escape for those who want to take a brief break from the beaches and sunshine. Descending the multitude of steps into Fantasy cave was slightly daunting, especially given the level of moisture this far underground. 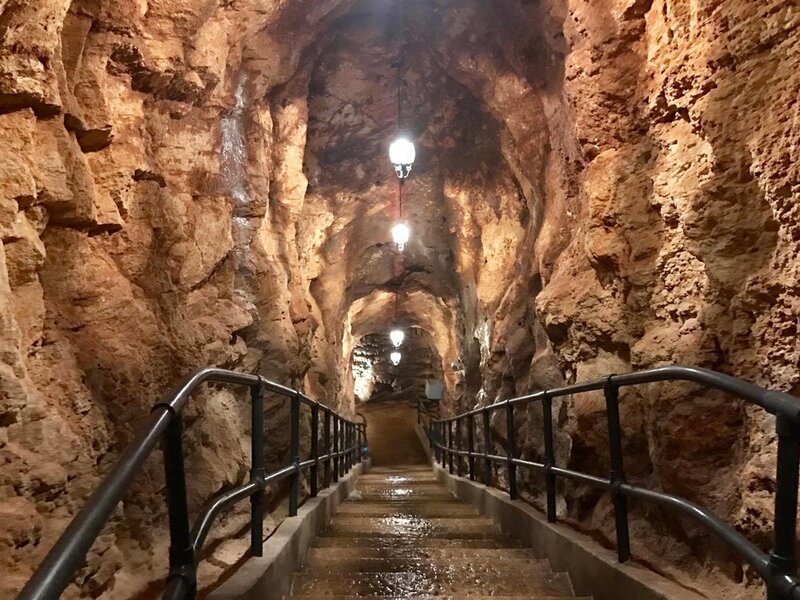 Tours with guides to each cavern come with any purchased ticket to visit. They depart every quarter hour or so and last approximately 30 minutes per cavern. Guides will point out the various unique geological formations in the cave as the group moves along. At some point on the tour, they will turn off the lights to desmonstrate the complete darkness in which these caves would've been discovered in. 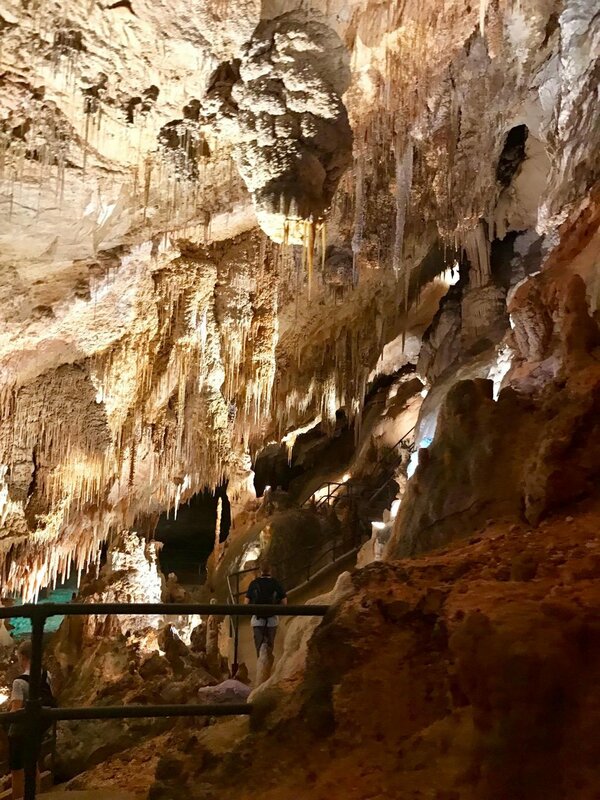 Crystal Caverns is this sights namesake and the original cave first discovered on the grounds. Somewhat similar to Fantasy Caves, a visit to both caves is recommended upon visiting. After the caves, we asked a taxi to take us to Horseshoe Bay. Opting to stop about a mile before the popular tourist beach, we walked along the south shore and passed several beautiful and more secluded beaches. Even a short distance down the shoreline, rock formations can change and small cliffs rise out of the water. The main beach of Horseshoe Bay, with a small restaurant, a gift shop, and a very large and clean public shower in the distance. 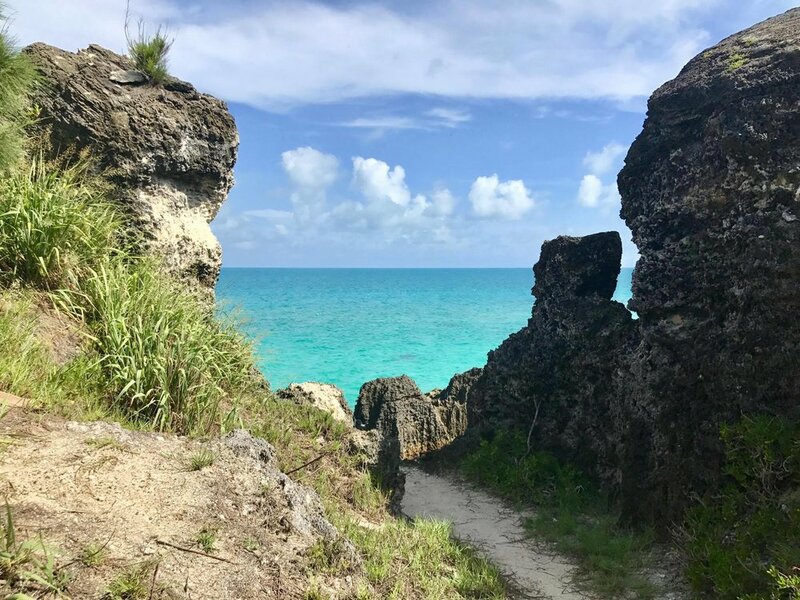 This is one of Bermuda's larger beaches and very popular with tourists, so coming in the afternoon, when the large cruise-ships have departed, may be a wise choice. But keep in mind that many amenities close to the beach close at 5PM here. A small alcove off to the distance, with large rocks that create a natural kiddie pool. From Horseshoe Bay, the town of Hamilton is a 15 minute car-ride away. Tucked away from the main street towards the back of the small city is a restaurant known as Mad Hatter's. Due to its popularity, its probably best to make reservations beforehand, though we were seated at 6pm having gotten lucky without one. The interior is as its name suggests, filled with funny hats (seen top right here). The menu skewed French, and all in all it was a delicious meal. Be sure to listen to their daily specials twice, as there are usually two to three additions to the appetizer and main courses every day. Below left, a baked brie with raisin bread and chunky cinnamon apple sauce. Right, a terrine that was less remarkable than the baked brie but still pretty good. Again, the famous Bermudan fish soup. This one was less generous on the fish than its counterpart at Swizzle Inn, but also less generous on the salt, a welcome change. Definitely a favorite here. Giant scallops wrapped in bacon, baked and topped with a sweet caramelized sauce, and a dash of salt and pepper to taste. Let it be known here: I. love. scallops. When cooked to perfection, their texture maintains a delicate balance between chewy and rubbery, let's call that perfection...bouncy. As I'm sure Gordon Ramsay will agree, they're delicious when cooked right. The town of Hamilton itself is delightfully picturesque if not slightly overrun with tourists. Seen here the main street of the town, where many restaurants and shops can be found, in addition to docked ships and the ferry to other parts of the island. The town's city-hall: statuesque and reflective of the wealth of the island nation. An artistic alley-way situated in the middle of Hamilton's busy central area. Eateries as well as stores line either side, and the lights make for a twinkling delight the darker it gets. 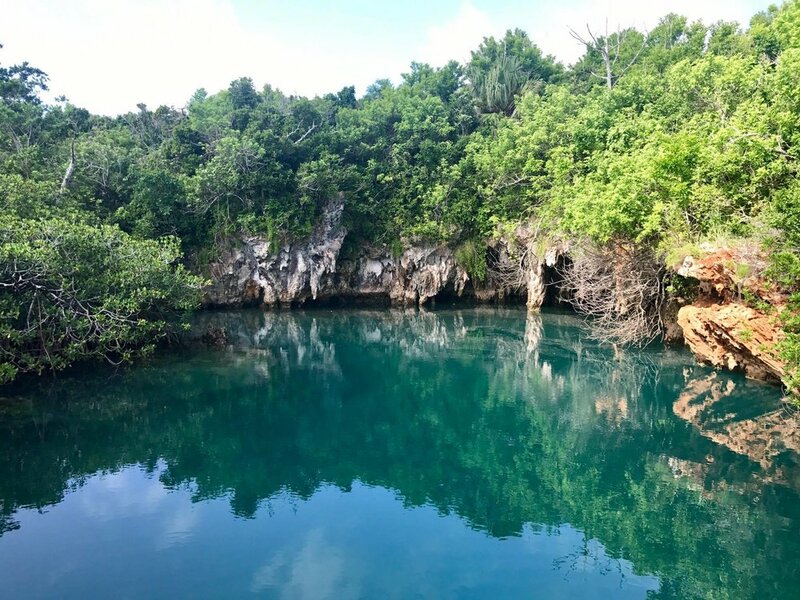 The morning started with a visit to Blue Hole Park, a truly turquoise lagoon located in an area on the northeastern tip of the island known as Tom Moore's Jungle. A little daunting to venture into at first, but well worth it. In typical Bermudan fashion, beaches could be seen every step of the way. The bright turquoise lagoon can be found nestled amongst thick growths of Mangroves. Re: tourist who has been coming here since she was small, this lagoon used to be a dolphin show many eons ago, with the caverns as the backdrop and chairs settled in what is now dense vegetation. Note that there is only a wooden viewing platform on the south-east corner of the lagoon. There is no direct way into the water, except to dive from one of two small cliffs on the right side. The shorter of which can be seen here on the right, jagged and clay colored, about a 10 feet or less drop from the water. (I'm in this photo). Yup, it's the larger than I'd have liked splash. Not as graceful a diver as my swimming days back in Canada, I'm afraid. Note that there is also no clear way out of the water except to swim towards the wooden platform, and there is a staircase formation of rocks that lead you out of the lagoon behind the platform. Its a very short way up but the rocks can be jagged and there is also some mud. Best to have someone throw your flip-flops to you or wear water shoes. If you swing by, be sure to try the 'firecracker baby squid.' Drenched in a tangy, creamy sauce with a kick, this mildly spicy concoction rounds out a deeply fried, and thus deeply crunchy and delicious twist on calamari. This little metal basket of fried goodness features monkfish cheeks and pork cheek confit. The cheeks (right) were less tender than I expected but still a treat nonetheless. The monkfish was as per usual slightly chewy in texture, especially for cheek. This isn't a hamburger but actually a twist on the quintessentially British 'chip butty - sandwich with fries in between. This one is known as the Ultimate Bacon Butty. Worth a try but I'd split in with two or threes friends, seeing as how many island activities require swim suits, and you'd want yours to fit and all. If there is one recommendation I can make as a must-stop for this small island nation, its going to be Admiralty House Park. 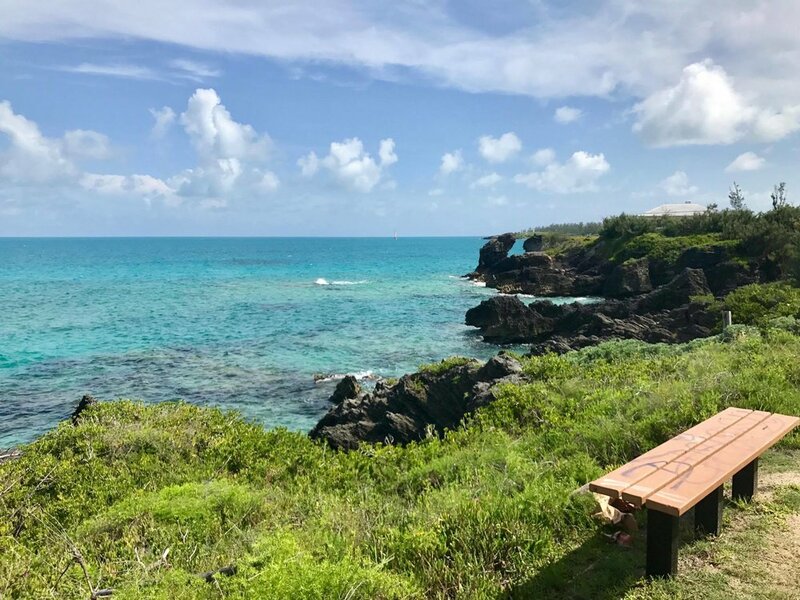 Once home to the British admiral that was assigned to the island, this stunning public park features gorgeous views of the ocean, waters that run the full spectrum from startling blue to soft green, and cliffs of various heights for the brave and not so brave to dive off of. Cars and buses will drop you off on top of the hill, walk down for steep cliffs and crystal blue beaches. Truly, if you only have time to make one stop on the island, make it here. Cliffs like this wrap around the out edge of the park. Its imperative to pick one that has darker colored waters to ensure there's enough depth to dive. If you're unsure, watch to see where the local kids are diving, or ask a local, whom were all very friendly. To access the cliffs, one can walk directly here as its all apart of the park, or swim around from the shallow beach area and climb up through the internal caves. Shoes are highly recommended for this climb. 'Fire coals' (not sure if actual name) grow in the water in the shallow caverns underneath these cliffs. If one steps on it with bare feet, it may cause extreme pain and temporary paralysis...so, watch out. The shallower waters and beach area is seen here to the right. A perfect place for sunbathing, a bit of swimming, and some snorkeling though there isn't all that much to see in terms of fish. The cliffs for diving can be assessed by swimming around this bend to the left (bottom left of this photo), where the waters get much deeper. Be aware of currents and other boats bringing other guests into the bay, however. Again, Admiralty House Park is just gorgeous and a delightful way to spend an afternoon. Here is me looking forlorn as I was about to leave. Seriously, worth a trip. Highly recommend. Speaking of musts, Art Mel's Spicy Dicy is arguably a must in Bermuda. 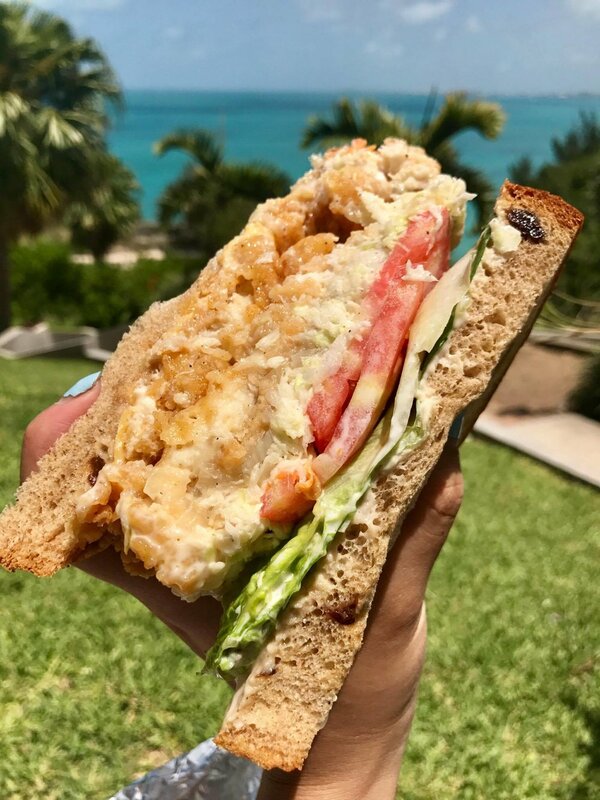 Yes, tourists and locals alike may have their own favorites on where to acquire this Bermudan staple - the fish sandwich. And yes, maybe they'll recommend their own favorite in the relatively farther Royal Naval Dockyard or in the town of Hamilton. But the general consensus is that none is more quintessentially delicious or authentic then the ones made in this small house on the outskirts of Hamilton. The interior is simple and ascetic - mostly locals picking up lunch on-the-go. We opted for the standard fish sandwich on raisin bread with everything - meaning cheese, coleslaw, tomatoes, and at least 3 - 4 other ingredients that escapes a mind in food-coma state after this sandwich. The tiny store has no seating, so it only sells sandwiches on the go. I brought mine to the aforementioned Admiralty House Park. But voila, the famed Bermudan fish sandwich. One would think heaps and fried fish and raisin bread might be unlikely partners, but in actuality the two ingredients come together in a delightfully harmonious fashion. The actual sandwich itself is huge, truly, and I would suggest sharing if one isn't particularly hungry. As in, not hungry enough to down a pound of fried fish, bread, and likely a dozen other ingredients in tropical climate. Anyways, for the lack of a better word: YUM. Somewhat of a last stop for the trip, the Royal Naval Dockyards are accessible from the Hamilton Ferry terminal daily. 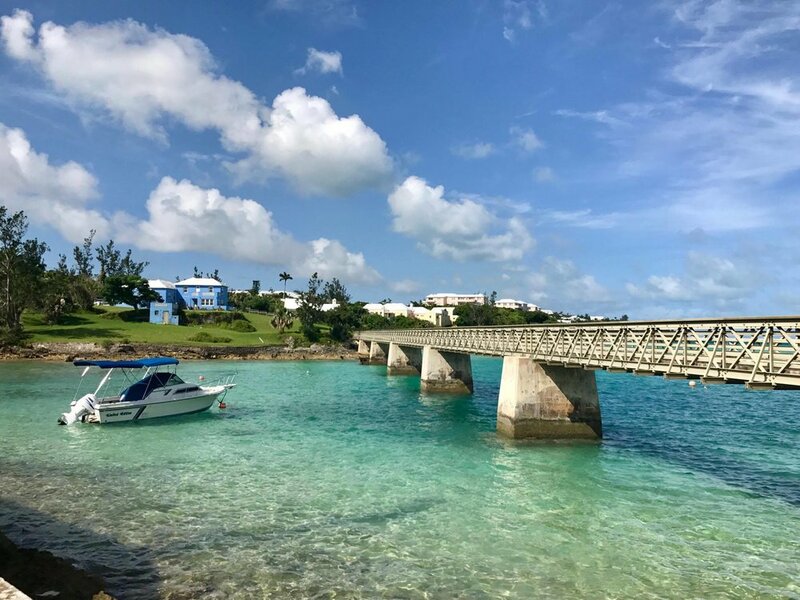 Mostly known as a cruise port, the dockyards are also famous for its museum, its art market, various souvenir shops and the boutique of the Bermudan Rum Cake Company. Bermudan Rum Cakes are a great souvenir and/or gift choice from the island. The one at the dockyards offers tourists the chance to sample various flavors, including traditional, chocolate, banana and more. If you don't want to carry one home with you, they also ship to the continental U.S. on their web store, though their cakes in current form do also pass through (U.S.) customs. This particular area also serves as a dock for many yachts. Though not a must on a busy schedule, it can make for an interesting hour or two of shopping as many stores are located here for the cruise-ships that arrive daily to the island. Another Bermudan must if one finds themselves here: Goslings Rum. Seen here in both the Black and Gold Label, the truth seems to be that the two only differ in color and not much in taste. On sell at the airport for a very reasonable price, visitors are limited to one per person and otherwise subject to an extra charge to purchase more. Though the packaging consists of plastic bottles and blunt black caps, it can be ordered at almost any restaurant in the country, and is heavily and frequently featured in any rum-based cocktails around the island. All in all, a wonderful two days spent on this tropical island. Though 48 hours is way, way too short, one can't help but fall in love with this place even in such a truly short amount of time. Being so close to New York, I know I'll definitely return for more of this picturesque island. Till next time, Bermuda.